As I previously mentioned, I love when students send me proposals for new initiatives. Throughout the year, proposals I’ve received have been everything from very simple requests such as allowing students to do morning announcements to greater ideas such as changing the format of our winter dance. As part of the Be Kind portion of our touchstone, each class is designated two weeks throughout the year to work on beautification of the campus. I always tell our students that we not only need to be kind to one another, but we can also show kindness by taking care of our environment. I didn’t give any specific guidelines so that the students would have a voice in planning their beautification weeks. When it was Ms. McAdams’ week, her students had a class meeting to brainstorm ideas. They created a list of ideas and one was getting approval for a vending machine. You might already be wondering (just as I was) how a vending machine is going to help beautify the campus? Ms. McAdams had the same question and the students response was to use the proceeds to fund improving the bathrooms. Three students took the lead and drafted a proposal that they then sent to me. The boys met with me and gave me their pitch. After our meeting I told them I was going to see if this was a possibility, but they also needed to do some research on laws around vending machines in schools. Over the course of a couple of months, the boys did their research and I got the go ahead to meet with potential vendors. The boys drafted up questions to ask the vendor and I don’t think I can adequately tell you how incredibly impressed I was with how well they ran the meeting with the vendor. They asked thoughtful and valuable questions. I know that when I was 14, I wouldn’t have been able to pull off what they did. I know they were impressed with what the vendor had to offer and it didn’t hurt that they were able to try all the snacks! Earlier this month I had the absolute pleasure of meeting with the boys and telling then that their vending machine would be delivered in two weeks. They were stunned...I really don’t think they thought this was actually going to happen. This meeting will be in my top five best memories of the year for sure. What a great confirmation of student voice being heard. Through hard work and determination these boys were able to achieve their goal. The vending machine arrived on Wednesday and while the boys will say this was a long process that required extra work, it was so worth it (take a look at the attached picture). The final step is for these boys to create policies for the use of the vending machine and the hope is that we can begin using it in a week or so. In reflection with the boys, they all agreed that this experience has been so empowering and they are truly proud of their efforts to make their idea a reality. I am proud of them as well, and grateful that I was part of this experience...such a true example of student voice and empowerment. 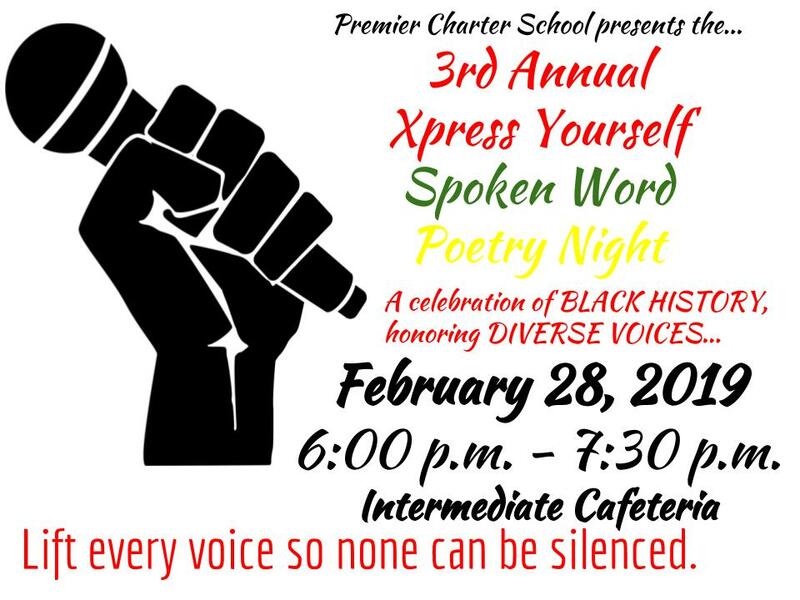 We are so excited to officially invite the PCS community to attend the 3rd Annual Xpress Yourself Spoken Word Poetry Night on February 28th from 6:00 p.m. to 7:30 p.m. in the Intermediate Cafeteria. This is an opportunity for us to celebrate Black history and honor the diverse voices of PCS students. Students who are recommended or volunteer for the program will recite original poetry, read a notable poem, or contribute to the program in some way. Teachers are already working with students to produce great poetry. Next week, students will receive information on how to be a part of the program as well as a parent letter with more details. Get excited about this great showcase of talent at our school. See the attached flyer. 6th graders have recently finished the novel Bud, Not Buddy and are excited to present our knowledge of The Great Depression in our created museum on Friday! Beginning next week, as we continue to analyze Bud's story in ELA, we will start learning about and writing poetry in Lit Lab in order to prepare for the poetry slam night in February to celebrate Black History Month! Blackout poetry looked intimidating to many, but the end results were amazing! 7th graders have done an incredible job pushing themselves out of their comfort zone and writing thoughtful poetry. Portfolios will be completed by the end of the month. Ask your child to share some of their work with you! Wow! Your children just created the neatest videos to showcase the places and things that have helped to mold them. In this project, we saw great engagement while students worked on a new skill, digital writing. They drafted, they revised, they edited videos, some added voice overs and narrations! Please ask your child to share his/her "Where I'm From" video; you won't be disappointed! The 5th, 6th and 7th grade students have really started catching on to learning the guitar! They are learning how to switch a few chords in time with music. This week, the students are also learning proper pick strumming. For enrichment, students have continued learning to play different percussion beats together as a group and have really grown in reading the percussion sheet music. to discuss and celebrate ideas with fellow students? to make an impact with your words? a platform and opportunity for your voice to be heard? to give your own TEDEd Club talk? Club Members will engage in a series of Explorations designed to help them present an amazing Club talk on an idea that they are passionate about. Along the way, Club Members will become experts in: • Identifying the elements of a great idea • Researching, developing and presenting an idea • Creating visuals to tell a compelling story • Using best practices for camera, lighting and sound! Print and return the attached permission slip. Space is limited and open only to Middle School students. This week was a tough one for the lady Eagles. The squad played on Tuesday, Wednesday, and Thursday. We had a rough start against our well known rival Confluence Academy South City with a score of 7-27. Next we were on the road to MICDS. The girls ended with a score of 14-39. The girls rounded out the week on a high note with a win against Gateway Science Academy, final 22-17. Thanks to all of the fans and parents who come out to show their support. You are greatly appreciated! The girls will have time to recuperate looking forward to the next game against Bayless on Wednesday, Feb 13 at 4:15 pm. It is time to start thinking about getting your group ready for our Annual Trivia Night. This is night you don’t want to miss out on. We are looking for donations for our silent auction as well as volunteers to help run the event. Please see the attached flyer for more information or email Terry Brogan at tbrogan@lashlybaer.com or Lisa Simon at lrsieve@yahoo.com. Sat Jan 26 12-4 p.m.